Two years after winning the Aussie Millions Main Event, @AriEngelPoker is hunting a repeat, 5/38 after Day 3. The third day of the 2018 Aussie Millions A$10,600 Main Event started with 158 players remaining out of a record-breaking 800-entry strong field, all aiming for their share of the massive A$8 million prize pool. After seven levels of 90 minutes each, the field was whittled down to see just 38 hopefuls in contention for the first-place prize of A$1.8 million. Former Aussie Millions champions Ari Engel and Ami Barer consistently built their stacks throughout the day on their mission to become the first ever two-time champion. Engel advanced with 1,075,000 and Barer ended Day 3 with 428,000. At the top of the counts, Mike Del Vecchio claimed a big lead over the rest of the field with 2,330,000. “That was about as physically good as somebody could run,” the American said. He headed to Australia full of confidence with a career-best score of $752,196 after finishing 3rd in the WPT Five Diamond World Poker Classic only a few weeks ago. Other chip millionaires at the end of Day 3 include two-time APPT champion Aaron Lim (1,358,000), Tu Lan (1,220,000) and Vincent Chua (1,089,000). 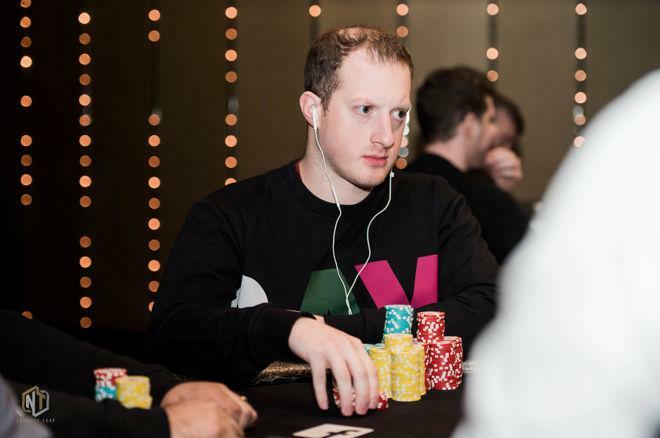 Kahle Burns, who received the Australian Poker Young Achiever Award at the Crown Casino during a break on Day 2 of the tournament, bagged up 973,000. Furthermore, Najeem Ajez (958,000), Espen Solaas (862,000), Bobby Zhang (714,000), Toby Lewis (571,000), Stefan Huber (538,000), Artur Koren (315,000) and Daniel Neilson (89,000) will all return for more action. Only the top 88 spots were in the money and among those to bust out before the money were such big names as Jesse Sylvia, Fedor Holz, Federico Butteroni, Sam Grafton, Paul Michaelis, 2014 WSOP APAC champion Scott Davies, Jonathan Karamalikis and Australian Poker Hall of Famer Mel Judah. Grafton ran a triple barrel bluff after his nut flush draw and straight draw bricked off and was called by start-of-the-day chip leader Najeem Ajez to bust with a bang. The money bubble burst without hand-for-hand mode having kicked off. 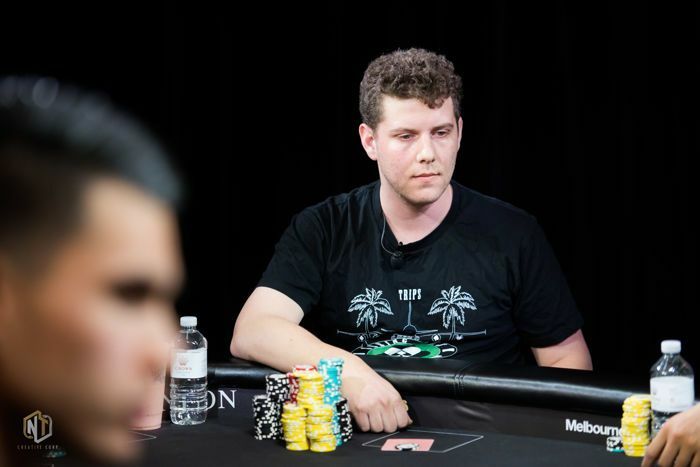 Down to 89 players, all current hands were supposed to be finished with two tables still running and that would prove to be crucial for Matthew Wakeman. Having flopped top set with pocket jacks, he check-raised all in against Toby Lewis and Harry Demetriou with both opponents calling before Lewis got the rest of his stack in after the turn when he improved to the nut flush with ace-jack suited. Demetriou called with queen-ten for the flopped straight and a blank river crowned Wakeman as the bubble boy. With at least A$15,000 locked up for their efforts, the remaining players dropped quickly afterwards, with Daniel Laidlaw, 2014 WSOP Main Event Martin Jacobson, Martin Finger, Day 1c chip leader Frank Pezzaniti, Duff Charette and Casey Kastle all heading to the payout desk earlier than they were hoping for. Pezzaniti's roller coaster ride ended after the dinner break when his ace-five suited faced the pocket tens of Corentin Hillion and the pocket jacks of Tu Lan. A jack on the flop and river gave Lan quads and he skyrocketed to the top of the leader board. At the end of the night, 2014 Aussie Millions champion Ami Barer dropped back into the middle of the pack while Del Vecchio took a commanding lead with the eliminations of Duy Ho and Anthony Hachem. The action recommences in level 20 with blinds of 6,000/12,000/2,000 on Friday, Feb. 2nd, 2018, as of 12:30 p.m. local time in the biggest casino in the Southern hemisphere, and the PokerNews live reporting team will be on the floor to provide exclusive updates. The full Day 4 table draw can be found here, and the live stream of the feature table can be followed on the runitup Twitch channel with a security delay of 30 minutes.